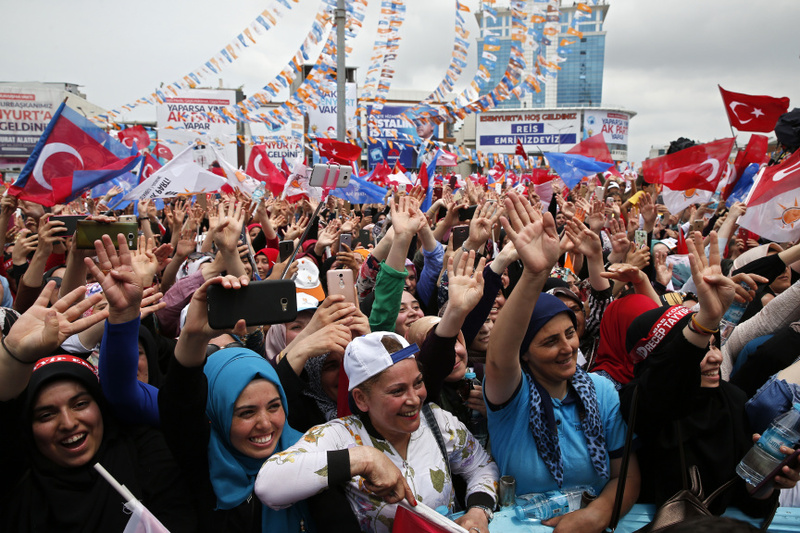 ISTANBUL (AP) — Turkey was awash in campaign promises Saturday as politicians pressed to get voters' attention in the last remaining hours before a ban began ahead of Sunday's critical presidential and parliamentary elections. Speaking at five different rallies in Istanbul, Turkish President Recep Tayyip Erdogan urged citizens to vote and listed the hospitals and transportation facilities built during his time in office as proof of his leadership. He also slammed his opponents for reportedly lacking vision. "The presidency requires experience," said the man who has led Turkey since 2003 as prime minister and since 2014 as the country's first directly elected president. The 64-year-old Erdogan called the elections more than a year ahead of schedule in a bid to usher in an executive presidency with sweeping powers. He said the new system will bring stability and prosperity to Turkey, but critics warn it could lead to a "one-man rule" amid signs of an unsound economy. Despite the short campaign season, the uneven media coverage and government resources that favor Erdogan, his competitors for the presidency and in parliament have launched a serious bid to unseat him. More than 59 million Turkish citizens, including some 3 million living abroad, are eligible to vote in Sunday's elections. It's the first time they'll be voting for president and parliament at the same time — a change approved last year by a referendum that switched Turkey's governance system to an executive presidency. Six candidates are running for president and eight parties have fielded candidates for 600 parliamentary seats. Five of those parties will also run as part of two competing electoral alliances: The "People Alliance" by Erdogan's ruling party and a nationalist party versus the "Nation Alliance" by the leading secular opposition, a nascent center-right party and an Islamic-leaning party. Erdogan's main opponent, Muharrem Ince, nominated by the secular Republican People's Party, drew hundreds of thousands of supporters to a rally Saturday in Istanbul. Confident and combative, Ince said "Erdogan you are going!" and called him a "fascist." Ince promised voters an independent judiciary that he said would stabilize the economy. He warned supporters that a "regime of fear" would continue if Erdogan is re-elected, predicting that financial markets would be rattled and the national lira currency would decline further. But halfway through Ince's rally, mainstream Turkish media switched over to a second Erdogan speech as he crisscrossed Istanbul, appearing in several districts. Earlier, he declared that Turkey was now one of the world's leading economies, citing more than 7 percent growth for the first quarter of 2018. As required by law, Turkey's state broadcaster aired a message to voters from pro-Kurdish candidate Selahattin Demirtas, recorded in a maximum security prison where he's been held for 20 months pending trial on alleged terror charges. He denies any wrongdoing and says he's Erdogan's "political hostage." Demirtas said it's crucial that his party passes a 10 percent electoral threshold to enter parliament to "strengthen the country's democracy and realize peace." If the party falls below that threshold, Erdogan's party could gain a majority. Demirtas said his party's loss would mean "a loss for all of Turkey." The liberal pro-Kurdish party has been the target of a massive crackdown by the government for purported links to outlawed Kurdish insurgents, with eight other lawmakers behind bars and thousands of party members arrested under a state of emergency still in place since Turkey's July 2016 failed coup. It says more than 350 members working on the election campaign have been detained in raids and at events since April 28.